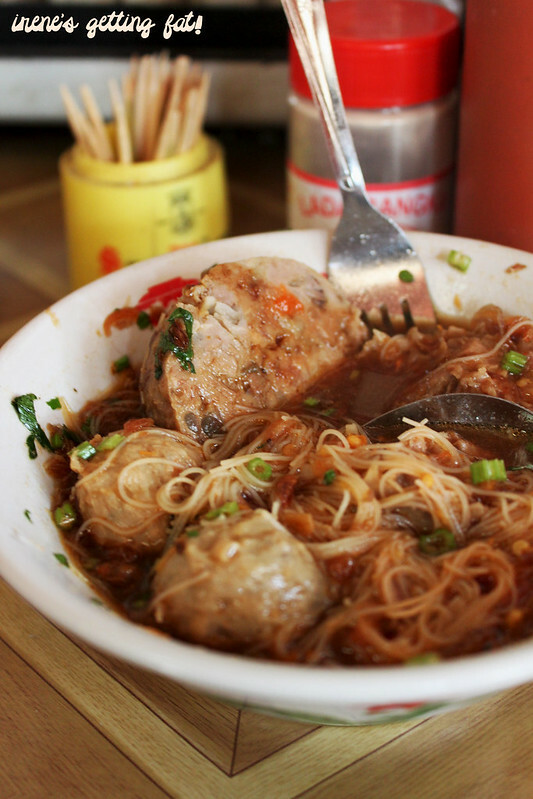 Behold, this is Indonesian style of meatballs (soup). Best eaten in cold weather, but still exciting in hot weather. Which in this case, is almost everyday in Jakarta. 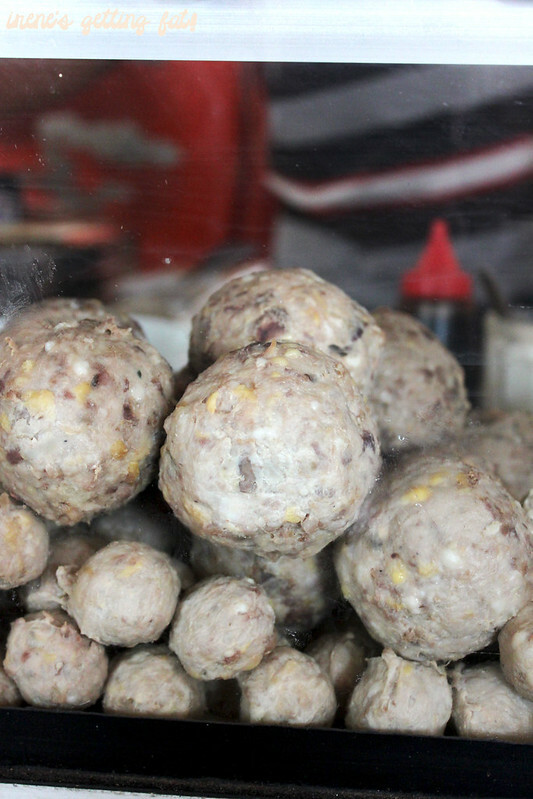 Bakso or meatball is really popular here, you can find it easily from street food stalls and motorbike-riding vendors who usually go around housings in the afternoon, or at fancier restaurants. However, I still think that the meatballs sold humbly by a street food stall or motorbike-riding vendor taste better than the ones from luxurious restaurants. 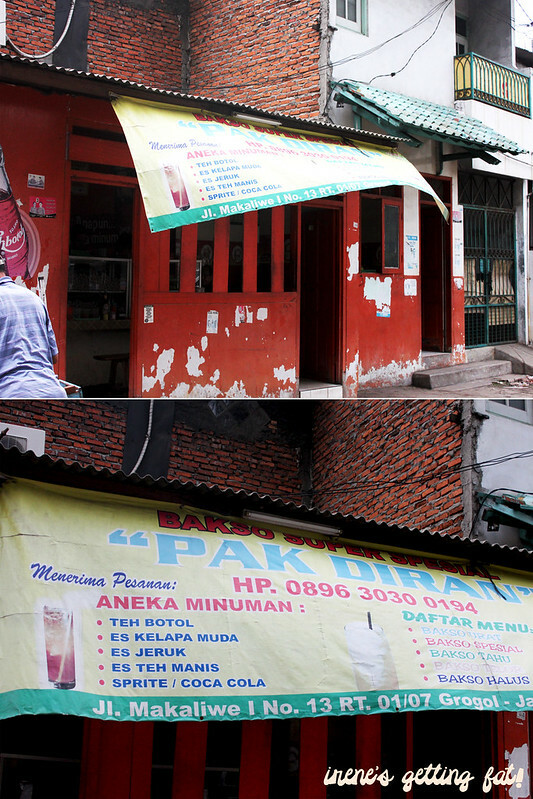 This time, I ventured further to find Roo's recommended bakso place, Bakso "Pak Diran" (English: "Mr. Diran" Meatballs) in Grogol. The place is very humble, and the only thing that pointed out that it was the place we were looking for was the solo banner hanging freely outside. Don't get fooled, Mr. Diran's meatballs are really popular, especially after a Sunday mass. Luckily, we came after lunch hour or we would struggle finding some seats. 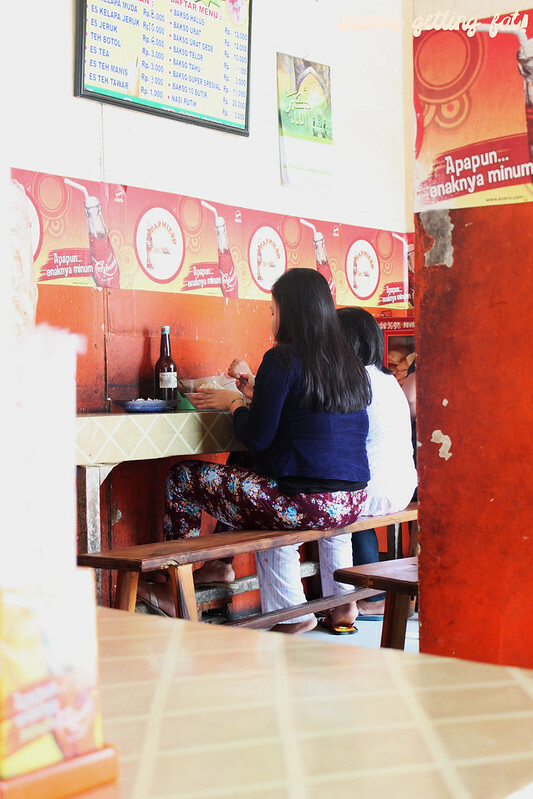 There aren't a lot of seating in the small area, but nobody seems to mind sharing long tables with strangers. Don't expect waiters handing you hard-cover menu books and waiting by your side to take your orders; here you must quickly pick your bowl of meatballs from the menu board. The service is rather good for a place as simple as this, they're polite and efficient. The cooking area is in the center of the room, where you can see huge pots with aromatic broth and cabinets full of gray-ish meatballs. Indonesian meatballs include flour in the making, hence the colour. Here, they offer bakso halus (plain/smooth meatballs), bakso urat (sinew meatballs), bakso tahu (steamed tofu with the meat mixture), and bakso telur (meatballs with whole egg inside). All served in clear soup and your choice of vermicelli or noodles or both. 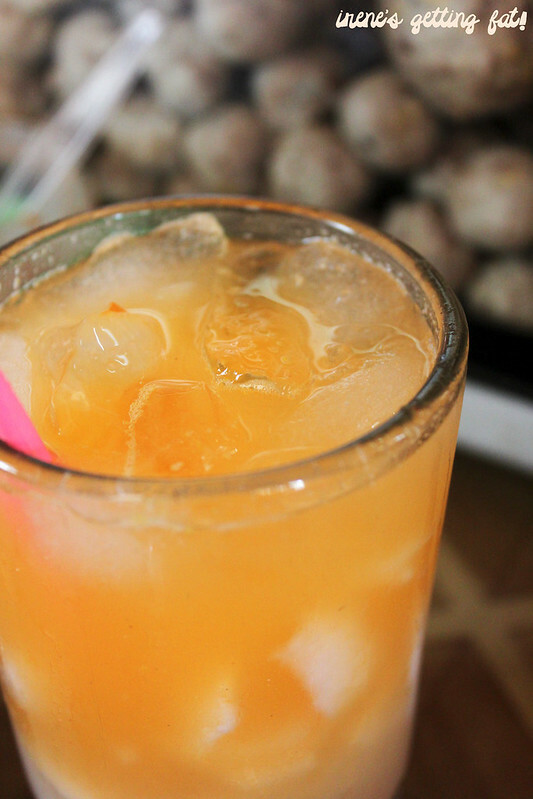 To combat the scorching heat that day, I had es kelapa jeruk, which is fresh orange juice with young coconut. If you haven't tried this, go for it. You wouldn't believe how well this combination actually works. 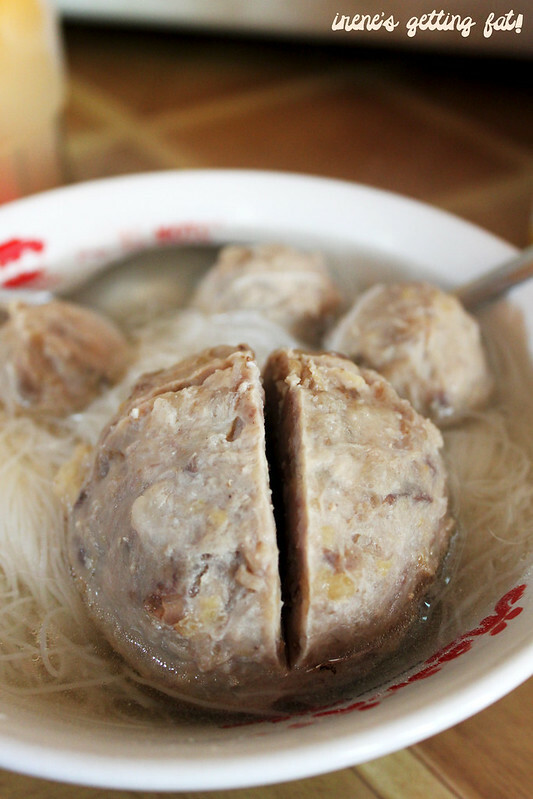 A bowl of bakso urat (sinew meatballs) is completed with vermicelli, and of course the fragrant broth. The broth is light but packed with satisfying flavour, although another pinch of salt would do this bowl good. The meatballs have perfect texture and bounciness, even the bakso tahu (steamed tofu with the meat mixture) is commendable with the smooth, salty tofu. 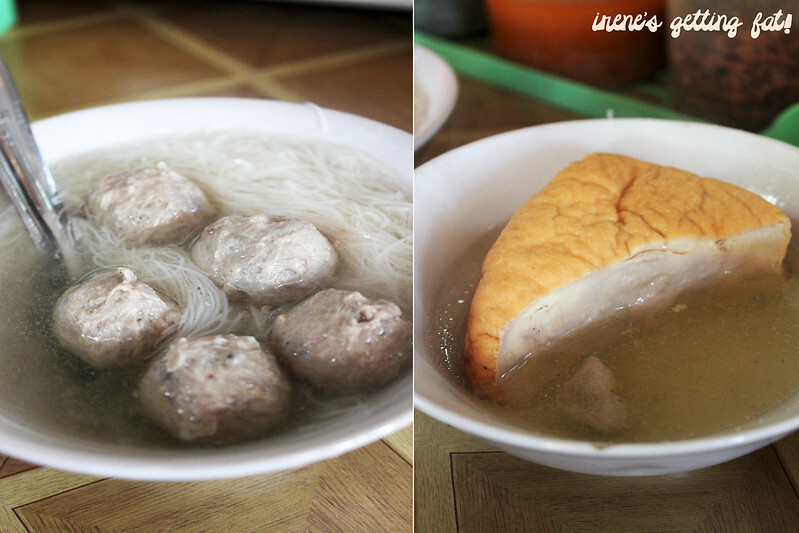 I tried the bigger version: bakso urat gede (big sinew meatball). 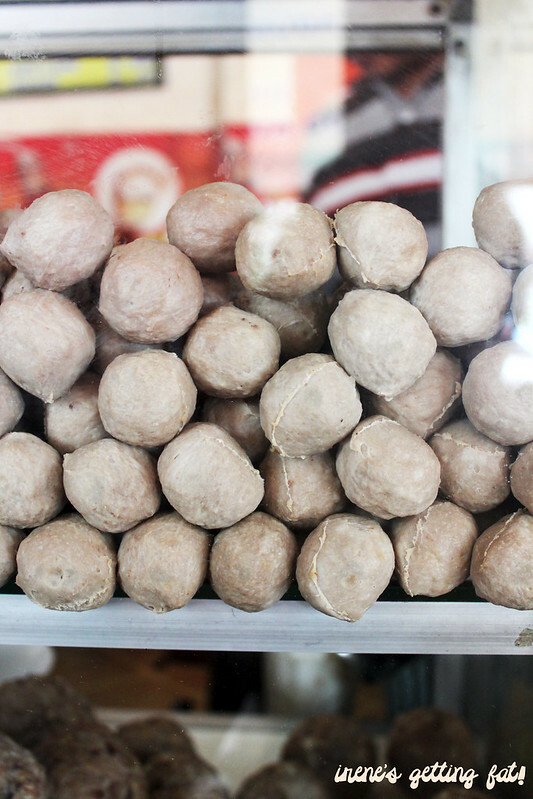 The tennis-sized ball is accompanied with three little sinew balls, along with the vermicelli. This one's even better than the small ones; more chewy chopped sinews inside that I love so much. Here's how a lot of Indonesians eat their bowl of steaming meatballs soup: with lots and lots of chilli sauce. Unfortunately, their homemade chilli sauce here isn't spicy for me, so I had to add heaps of it to get a bit of kick on the tongue. Sweet soy sauce, chopped celery, and fried shallot are also a must. 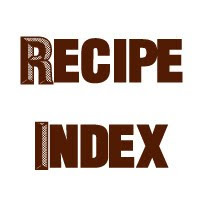 Overall, it's really a nice place to satisfy your craving of good Indonesian-style meatballs soup. It probably isn't the best meatballs soup I've had, but it sure is a great one. Really good meatballs, nice arrays of menu, place is rather clean, ambiance is OK but expect queues in peak hours, price is affordable, service is OK.
Yummm I love dumplings! And orange and coconut sounds lovely. I'm not sure why I haven't tried that before! BAKSO PAK DIRAN SAYA RASA PALING OK! KETIMBANG BAKSO JAWIR DAN BAKSO GREENVILLE! BAKSO JAWIR MEMAKAI DAGING JANTUNG SAPI,BAKSO GREENVILLE OK TETAPI TERLALU TERASA MERICA JADO OVER ALL BAKSO DIRAN PALING OK!